Perfect for the Batfan in your life. 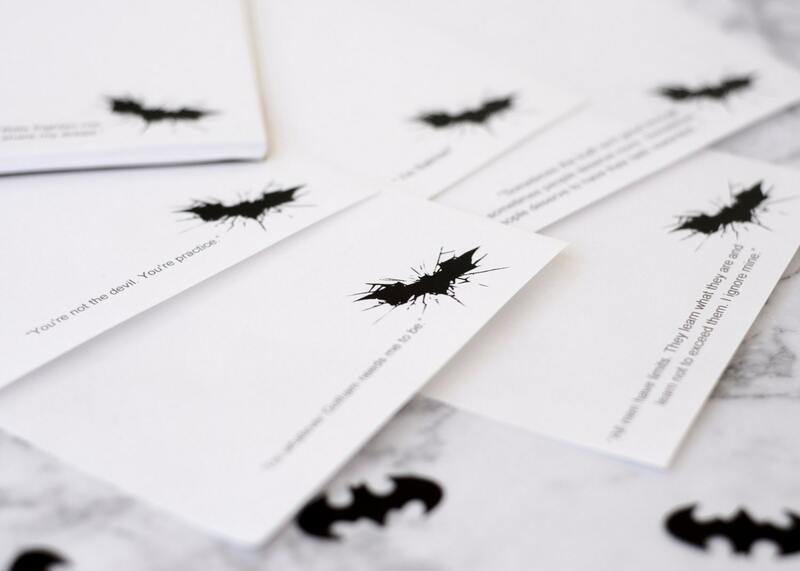 This Batman inspired Note pad personalized with your (or your friends) first name and up to 6 different quotes on the bottom. Choice of name colours and quotes (6)! Made using 24lb bond paper with either 50 or 100 pages. Page Size quarter page 4.25" wide by 5.5" high or half page 5.5" x 8.5". Includes a coordinating card stock backing. Makes a great gift for the batman fan in your life, or for you own desk or work space. I can do any quote you like, please leave it in the Notes to seller being sure to spell correctly. Please try and select shorter quotes, many of Batman's are more monologues than quotes, and I can do whatever length you like, but it will affect how much of the page is taken up by it. 1. All men have limits. They learn what they are and learn not to exceed them. I ignore mine. 4. I'm whatever Gotham needs me to be. 5. You're not the devil. You're practice. 6. Bats frighten me. It's time my enemies share my dread. Please include the desired customization in the notes to seller. If no customization details are given Bat-Notes will be on the top and randomly selected quotes used.